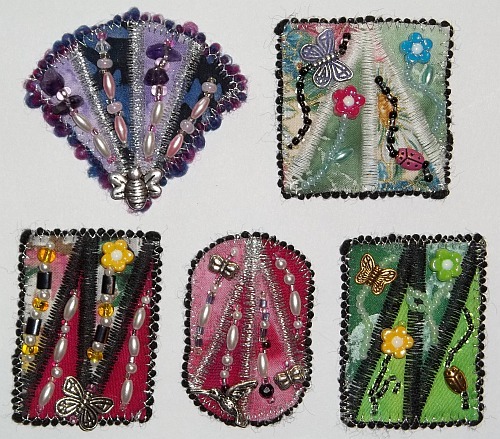 Group of 5 pins beaded while writing the pattern. Another reason it took so long to do is that I ended up with 22 pages including 77 photos to show the process. This pattern is written so that just about anyone can be successful creating their own pins. As long as you know how to use your sewing machine and can set it up for a zig-zag stitch (and aren’t afraid of tiny pieces), you can make these pretty little gems using little bits of leftover fabrics from other projects. I have added instructions for fusing, satin stitch seaming, couching yarn, and more. A more advanced user of the pattern can just skim through things they already are familiar with and move to the next steps. Now that the stitching, beading, photos and writing are done, I needed a bit of help…. Before I make the pattern available for the public through my Craftsy Pattern Store, I would like to have it looked at by a few others first. I have sent a bunch patterns out free to commenters willing to read through it to see if there are any glaring boo boo’s in the writing, and give making pins a try, to see that the instructions make sense to others. I am always worried about missing something or having a confusing step or two. I really want my customers to be successful with my patterns and learn techniques that are needed for the project and also be able to use them in other projects of their own. How to get a FREE Pattern… Ooops! All freebies are gone.. I will be sending free patterns out on a first come, first sent basis… They will be sent in PDF form via email. PLEASE, ask for a free pattern only if you have the time in the next couple days to read through it and make a pin or two, then give me feedback as to confusing areas, steps, wording, etc. Any other input would be appreciated…. Were the instructions easy to follow? Do the photos show what is needed? Are there photos that don’t seem necessary? Would you recommend this pattern to a friend? Woo Hoo!! I have 11 testers now (I was away this afternoon and came home to one extra, so sending to that one, too), so if you are interested in finding out about when it “goes live” for purchase, check back, or subscribe to my blog by email or RSS to find out about new posts as they are available. Many Thanks in advance to those giving my pattern a try!! ‹ Pins, Pins, More Pins and a Pattern! I’d love to give it a try. I did some testing for Annie Smith and really enjoyed it. If they don’t take TOO long to make, I should have the time. I’d love to try your cute brooches. I have oodles and oodles of supplies for crazy quilting that would look great on your pins. I would love to make one of your pins, especially finding new ways to combine the machine with beading. I’d love to be one of your testers. I primarily work with fabric and want to try a new medium. I love working with fibers, threads and beads. Would love to try out your pattern for you. A good project for my new studio now that Open Studios is finished. I’d like to help with your pin pattern. I would love to be one of your pattern testers. Your pins are so cute! I’m a mixed media artist and writer/editor (freelance and nonfiction) in Boulder and would be thrilled to proofread and try out your new pattern for you. I also took a look at your website and love your artist trading cards. Do you have a tutorial or pattern for those, too??? Congrats on the website!!! I can “test drive” your new pattern during the week of Halloween or later. Looks like fun. I would like to try your new pattern. I’m a quilter who likes to embellish. Beautiful pins, would love to review the pattern. Sue…I would like to make one of Your Pins. I have not done anything quite like these & would Happily give my viewpoint as a novice, anxious to learn & critique. I do Handpainted Silks.